January 10, 2018 Wall St. Rockies Comments Off on 19e. HELP! Significance – The Beatles are widely regarded as one of the most influential acts of the rock era. Back in the days of Beatlemania, the Fab Four created complete pandemonium when they flew into Denver to perform at Red Rocks. Inscription – On August 26, 1964 five thousand screaming fans waited outside the Brown Palace Hotel for hours hoping to catch a glimpse of their idols, the Beatles. Well-rehearsed in evading mobs, the “Fab Four” sneaked into the hotel through a service entrance, but were trapped between floors in a service elevator for five minutes before making a run for their eighth floor suite. The British Invasion was a cultural phenomenon of the 1960s, when rock and pop music acts from the United Kingdom, as well as other aspects of British culture, became popular in the United States, and significant to rising “counterculture” on both sides of the Atlantic. British blokes Beatles were international cultural ambassadors for a new style of music called rock and roll. The Beatles’ legendary trip to the Mile-High City and the Aug 26, 1964 concert is remembered to this day for the impact the band had on Denver. For the John Lennon, Paul McCartney, George Harrison and Ringo Star, it was the 6th of 32 shows in 24 cities on a whirlwind US tour that passed like a blur. Their 1964 tour was far more than a series of concerts. The iconic appearance of the Beatles on the Ed Sullivan Show in February had catapulted the Beatles into the center of frenzied, worldwide phenomenon. The band was making front-page headlines everywhere they went. On that fateful late August day, the Fab Four invaded Denver by airplane, flying in from Los Angeles where they had just successfully played the sold out the Hollywood Bowl. Manager Brian Epstein had leased a plane – a Lockheed Electra – which cost a hefty $37,000. It landed at Stapleton at 1:35 p.m., and when John, Paul, George and Ringo disembarked, they were greeted by an estimated 10,000 screaming fans. It was the “the weirdest thing I’ve ever seen,” noted a Denver Police officer. Then came the drive to the hotel…the Beatles’ caravan of cars bound for the Brown Palace, was surrounded by kids, reporters, DJs and, of course, a swarm of police officers following the motorcade on foot, on motorcycle and bicycle. At the Brown Palace were 5,000 screaming, crying, teenage girls clamoring for a glimpse of the band. Some teenagers went to the concierge to ask for jobs as housekeepers in the hotel in hopes of seeing their musical heroes. A limousine appeared, carrying reporters who were traveling with the band. Fans mobbed the car thinking it was the band, while the Beatles’ limo sidestepped the crowd and went to the service entrance to the hotel. During the hullabaloo, one fan bit a cop’s hand in the frenzy. Another girl went to the hospital after a car ran over her foot. In total, six civilians and one officer wound up in the emergency room due to the near-riot at the hotel. The Beatles gave a press conference just before their performance. at They were made honorary members of the Jaycees and were each given a Jaycees vests with their first names embroidered on the left breast. The opening act was Bill Black Combo, allowing the Beatles to take the stage at 9.30pm. During the show they frequently felt out of breath due to the thin air in Denver, so oxygen canisters were placed on the stage for them to use. The Beatles performed for about a half hour and their standard 12-song set which they played for most of the tour: Twist and Shout, You Can’t Do That, All My Loving, She Loves You, Things We Said Today, Roll Over Beethoven, Can’t Buy Me Love, If I Fell, I Want to Hold Your Hand, Boys, A Hard Day’s Night and Long Tall Sally. They were $20,000 for the performance (Even though most other big acts of the era were making about $5,000.) and set a box office record for the number of tickets sold for open-air stadium. Legend has it that folk star Joan Baez met the Beatles at Red Rocks and went back to the Brown Palace with them after the show. She arranged for the Beatles to meet Bob Dylan later in the tour. Rumor has it that it was Dylan who introduced the Beatles to marijuana. 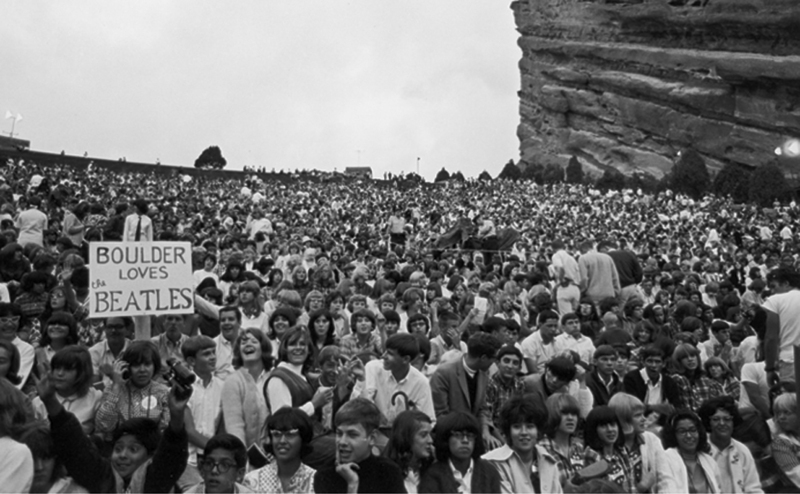 For Denver, the Beatles performance established Red Rocks as a premiere performance showcase. 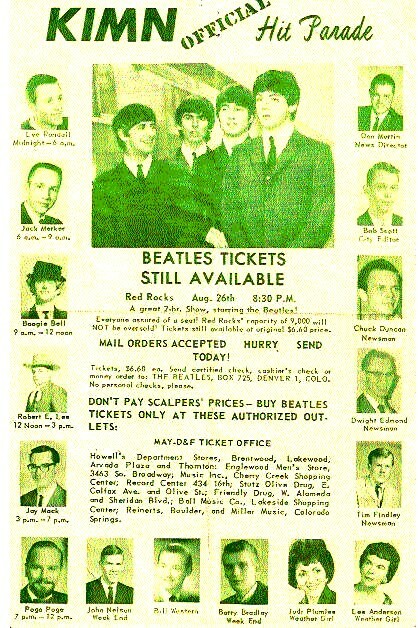 The Red Rocks show was never made for an album release, although their Denver press conference was included on this spoken word album Hear the Beatles Tell All. Please explain the British Invasion. How did the Beatles performance affect Red Rocks’ reputation? For what were the Beatles were international cultural ambassadors? Why do performers at Red Rocks get out of breath? Why did the Brown Palace sell squares of the Beatles’ bed sheets?